warning to those behind the penetration of the conspiracy. “No good deed goes unpunished” is an adage that is quite applicable to the real story of Lee Oswald. His idealistic nature and ardent search for his mission in life propelled him into the most dangerous game on the planet in the early 1960s. Such was his naiveté and quixotic approach to life that Oswald would be thrust onto a battlefield that guaranteed he would be caught in the crossfire. And so he was on November 24th, 1963. Whatever you have heard about Lee Harvey Oswald has most likely originated with the ultra-secret CIA Assassination Team which oversaw every aspect of President Kennedy’s assassination. More accurately, it was their Langley-based propaganda arm, as well as numerous organs of disinformation that were responsible for the entire JFK assassination coverup. Therefore, it is imperative to suspend any and all judgment concerning Lee Harvey Oswald (LHO) while reading this authoritative account. The evidence and testimony in this exposé is as factual as it is credible and provides a penetrating insight into the modus operandi of the typical CIA assassination and/or false flag operation. All of these new details surrounding the true relationship between and among John F. Kennedy, Robert F. Kennedy and Lee Harvey Oswald have been corroborated as much as possible at this late date. Thanks to the internet, their is now a wealth of information and data available concerning both the assassination and the coverup. Events and meetings have been verified via the public record. Dates and times have been authenticated with actual news reports. Key individuals have been identified by firsthand accounts, as their accomplices have been confirmed. Critical relationships and conspiratorial collaborations have likewise been substantiated. 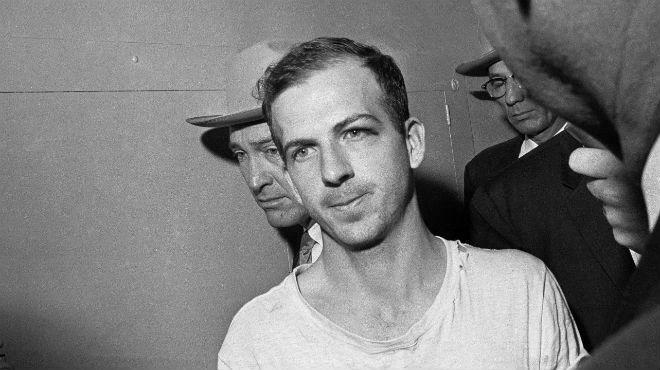 In the end, Lee Harvey Oswald will be known as the unsung hero who was quite meticulously framed by the CIA, the FBI and the Dallas Police Department. Framed because he was known by the CIA to be working very closely with the Kennedy brothers. John Kennedy was well known for his dissatisfaction with the CIA’s incorrigible abuse of power and numerous rogue elements. Both he and Robert were intent on eliminating all the black operations conducted by the CIA in collaboration with the Mafia and Cuban exiles who wanted Fidel Castro dead. Particularly after the Bay of Pigs fiasco was JFK determined to rein in the CIA, if not shut it down altogether. The ensuing, unparalleled intra-governmental feud was going on at the same time that Bobby Kennedy had declared war on organized crime, especially the Italian mafia families in New York City, Chicago and New Orleans. After singling out the Mafia for an unprecedented spate of federal prosecutions, the Italian-American mafioso Carlos Marcello — “Godfather” of the New Orleans Mafia — became a special target of the Justice Department. Because of the CIA’s direct collusion with this Louisiana mob figure and a NOLA clique of Cuban exiles in their attempts to overthrow the Castro regime was Oswald assigned by RFK to infiltrate that totally rogue operation. The last thing the Kennedy brothers wanted to be associated with was the unlawful assassination of another head of state — Fidel Castro. Toward that end Oswald’s deep cover status was fiercely protected throughout the Attorney General-run sting against the anti-Castro movement which was growing more volatile by the day. The failed assassination attempts on Castro’s life only seemed to increase the fervor of so many Cuban exiles who wanted their country back no matter how. This specific inter-party dynamic and the collaboration among these three groups is crucial to understand. They all had the same goal in mind: To take back Cuba. After all, Havana had become a veritable oasis for the international set of glitterati, gamblers and gunrunners. When Castro finally took over Cuba in 1959 he ended the party of all parties. Cuba was fast becoming the major link in the burgeoning international illegal drug trade. When he turned off the lights in the famous Havana casinos, he also terminated the illegal drug trafficking which then closed down the highly profitable Cuban market. 1959 was not a good year in Cuba for those who saw their casinos shuddered, their drug and prostitution rings broken up, their loansharking operations and protection rackets closed down, and their gunrunning terminated. A capitalist ‘dream’ turned into a communist ‘nightmare’ with the guerrilla revolution that overthrew the exceedingly corrupt regime of Fulgencio Battista. The very nexus of all these dubious activities — transnational illegal drug trafficking — was the core business that the CIA, the Cubans, and the Mafia shared. So profitable were their respective shares of the drug revenues that they were willing to anything — ANYTHING — to get it all back. For the diehard Cuban capitalist, facing Castro’s firing squads was completely out of the question; hence, many an exile showed up in Miami and New Orleans, the two major hubs for the fleeing Havana exiles. New Orleans, however, became the magnet for those fanatics who would participate in any plot whatsoever that would allow then to reclaim their former piece of Cuban paradise. What united them more than anything was their hatred for Fidel Castro. When the Kennedy Administration withdrew their support for this cause, the Cuban exiles redirected their intense hatred toward the President, as did the involved Mafia families and many rogue elements within the CIA. Come the fall of 1963, these animosities had been festering for years and looking for an outlet. All three parties — the CIA, the Cuban exiles, and the Mafia — shared the same agenda and had conveniently overlapping goals. Each of them felt betrayed by the Kennedy’s after the Bay of Pigs debacle, although the Administration felt they had been betrayed by the CIA and the Joint Chiefs. Nevertheless, President Kennedy fell squarely within their crosshairs that November. All the pent up rage was quite purposefully channelled toward JFK’s demise … by those ‘stakeholders’ who truly controlled the realm. This photograph was taken in a nightclub in Mexico City on 22nd January, 1963. 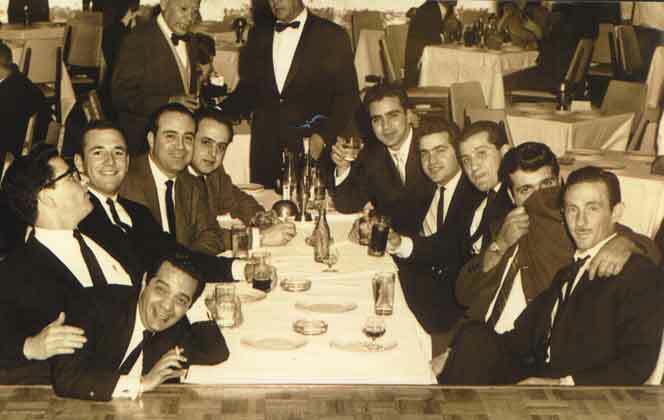 All of the men in the photograph are members of Operation 40, a Central Intelligence Agency-sponsored undercover operation in the early 1960s. The group was initially formed to seize political control of Cuba after the Bay of Pigs Invasion. It’s primary function included an ultra-secret CIA assassination team that was mobilized to execute heads of state, politicians, military officers, etc. in nations identified for regime change. Robert F. Kennedy knew that multiple plots were afoot to bring them down. Where his older brother John (by 8 years) had managed to live through World War II and seen the horrors of war, Bobby had not. Whereas JFK was known to have some very serious medical conditions that required regular monitoring, Bobby was young and healthy. He, too, had aspirations of being president one day, after a successful stint as Attorney General within the wildly popular Kennedy Administration. Therefore, his instincts for self preservation were greatly sharpened, unlike JFK who knew he could take the hit at anytime. As Attorney General, Bobby was much more aware of the scuttlebutt on the street, especially on the streets of New Orleans and Miami. He was also privy to much inside information from his “eyes and ears” within the organized anti-Castro movement. The investigative apparatus of the Justice Department also provided him with massive amounts of privileged information, especially in regard to Jack’s pet project — exposing illegal CIA-sponsored anti-Castro activities. For it was this particular pretext that JFK would use to forever shut down the CIA. Allen Dulles, the first civilian Director of the CIA, was deeply involved in regime change around the globe. After the failed Bay of Pigs operation, regime change in Cuba became much more unlikely, as history has shown. “In autumn 1961, following the Bay of Pigs incident, Dulles and his entourage, including Deputy Director for Plans Richard M. Bissell, Jr. and Deputy Director Charles Cabell, were forced to resign.“ The firing of Allen Dulles proved to be the most consequential act by President Kennedy as it greatly fueled the “Cuban Angst” problem. There is another very significant backstory to the burgeoning anti-Castro movement that revolves around heavyweights like George H. W. Bush, Richard Nixon, Barry Goldwater, Allen Dulles, J. Edgar Hoover, Lyndon B. Johnson and some very powerful conservative businessmen. There’s no question that these high profile political powerhouses were being pushed by their corporate overlords to undo the Cuban revolution. Not only did they not want a communist state in their back yard, they didn’t want their myriad commercial interests threatened throughout Central and South America. The specter of industry-wide nationalizations was already looming in various left-leaning countries. Rogue elements within the CIA, fanatical Cuban exiles, avaricious NOLA mafioso and the like were merely the tools in this raging war between capitalism and communism. Their collective hatred — and deep-rooted fear — of Communism became the central organizing principle for a virtual conglomerate of various government institutions and corporate entities. Castro’s Cuba was regarded as anathema to this burgeoning movement. The Kennedys and Kings were simply no match during the tumultuous 1960s. History was overwhelmingly on the side of the warmongers, not the peacemakers, as the shocking succession of tragic assassinations during the 60s demonstrated. Come 1963, two years after the Bay of Pigs, the frustration and anger was to reach a boiling point. All the money and resources, time and energy, personnel and training that were marshaled toward assassinating Fidel Castro were simply redirected toward assassinating President Kennedy. Even the assassination training camps owned by Mike McLaney in Lacombe, Louisiana were teeming with angry Cuban exiles, mafia hit men and rogue CIA agents. Trigger-happy is the only way to describe the combustible atmosphere, and the Kennedys became the target. For these, and other reasons, Bobby Kennedy chose Lee Harvey Oswald — as an ultra-secret, supra-classified counterintelligence asset to infiltrate the CIA-Cuban-Mafia movement. In that capacity, Oswald literally functioned as a one-man domestic counterintelligence operation. Because he was born in New Orleans he knew well the lay of the land there. He also lived in Dallas upon his return from the USSR since his mother and brother had moved there. However, it was his lifelong affinity to socialism and communism which made him a natural fit for the mission that RFK had in mind. Because Oswald had a longstanding interest in communism, he defected to the USSR at a very young age just before turning 20. This extraordinary initiative alone demonstrated his unusual courage and commitment to act on his convictions. Certainly, to proceed with that major move, especially given the “Red Scare” political climate of the 1950s, was to go against the grain in a most countercultural way. Therefore, RFK knew he had an extremely unique character in the person of Oswald, someone who was brave enough to walk into the fire pit of the New Orleans-based, CIA-controlled, anti-Castro movement. He also knew that Oswald could be trusted in a way that no one else could be. In other words, Lee Harvey Oswald was willing to sacrifice his life for a much higher purpose. And so he did! After Oswald grew disillusioned with life in the USSR he looked for a way back to the USA. Given the manner in which he moved to the USSR, his citizenship status was both ill-defined, highly unusual and practically unprecedented. Although he never renounced his US citizenship, his application to return to the US with his wife and child was quite surprisingly approved. 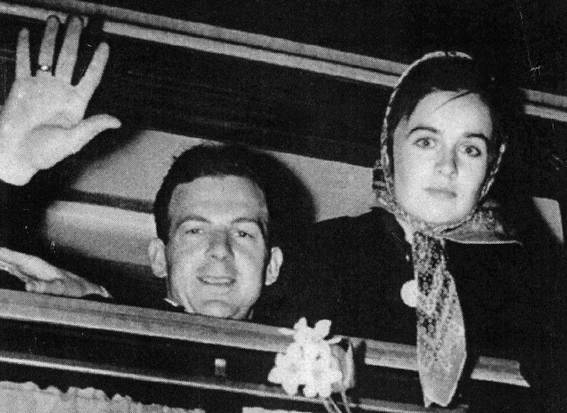 Not only was his Russian wife, Marina, permitted to emigrate, “the U.S. Embassy gave Oswald a repatriation loan of $435.71”. Qualified researchers have noted that such an accommodation from the State Department could only have been provided with the explicit approval of the US Attorney General. Another very curious and inexplicable thing occurred during Oswald’s return to the states with his family. When “Oswald, Marina, and their infant daughter left for the United States, … they received no attention from the press, much to Oswald’s disappointment”. This particular “nonevent” speaks volumes, especially in light of the obvious Cold War PR success that such a repatriation would have represented. Truly, it doesn’t get much bigger than that — a US citizen moving back from the USSR … with his new Russian family in tow. How was that explosive media event squelched, except by very purposeful design. Because of the super-secret mission planned by RFK to utilize Oswald, there could be no press involved. Otherwise, his every move and word might be watched by the media at a time when anonymity or being low key was absolutely necessary. Oswald’s own “disappointment” is more than likely due to being unaware of the true depth and breadth of his future mission. Although, it is very significant that he was only 22 years old at that time. Surely not an age when his peers were traveling the globe looking for a noble cause … a serious mission … or a higher purpose in life. It is during this period of his life that some investigators believe that Oswald was brought directly under Robert Kennedy’s wing. RFK had a dire need which very few individuals could fulfill. Lee Oswald was a man desperately looking for his mission in life. In New Orleans, and Dallas, were they both able to accommodate each other in such a manner that nothing less than National Security was being served — in the most essential way. Unfortunately, and unknown to Oswald, the rogue elements within the CIA knew exactly where his loyalties lay. For this reason the trap was being set the very day he showed up in NOLA, as it was then sprung later in Dallas. Upon entering the New Orleans scene, Oswald quickly became aware of plots and intrigues of every shape and size by strategically inserting himself wherever possible. However, it was in Dallas in October of 1963 that he was made privy to various conspiracies to assassinate the President. Little did he know that these revelations were by deliberate design. Thinking that his sleuthing uncovered these conspiracies, Oswald unwittingly walked into the scheme that was being planned in Dallas as a backup to another ‘assassination plot’ that was located in Chicago. That ‘assassination plot’ also had a patsy — Thomas Arthur Vallee — whose profile was very similar to Lee Oswald. The REAL Irony: It was Oswald who helped save JFK from an ‘assassination plot’ three weeks earlier in Chicago. In so doing, he sealed his own fate. Only because of the aborted ‘assassination attempt’ on JFK three weeks earlier on November 2, 1963 in Chicago did Oswald ultimately become the fall guy in Dallas. Not only did Oswald have nothing to do with the assassination of John Kennedy, he was actually working to uncover different assassination angles for Robert F. Kennedy. After becoming aware of the Chicago assassination plan, Oswald phoned in a tip to the FBI warning JFK not to travel to Chicago on November 2, 1963. Kennedy’s inner circle then used a pretext to cancel his visit to Chicago, thus postponing his murder by another group of assassins utilizing high powered rifles. The evidence shows that a “Lee” tipped off the Secret Services (and FBI) regarding the Chicago plot. 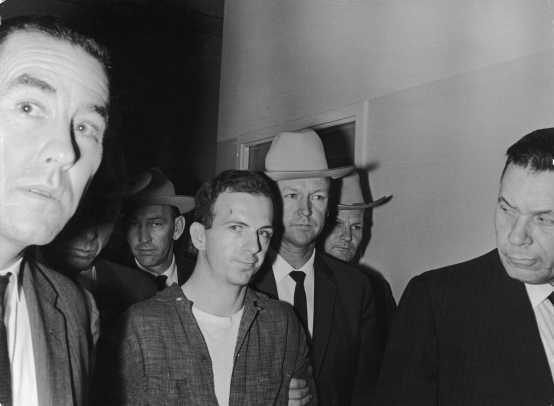 And leading up to that plot, as well as the Dallas assassination, Oswald met with the FBI for various “reasons” such as getting agents to visit him in jail after he was arrested in New Orleans. There were also meetings with FBI Special Agent James P. Hosty, passing/receiving envelopes to/from FBI agents at the Crescent City garage in NOLA as witnessed by his boss Adrian Alba (Supervisor at the Reilly Coffee Company), and his ‘threatening’ note (which was destroyed) to the FBI office in Dallas about two weeks before the assassination. Oswald was an FBI informant according to suppressed documents of the Warren Commission, which Chief Counsel J. Lee Rankin knew, as did all the Commission members. 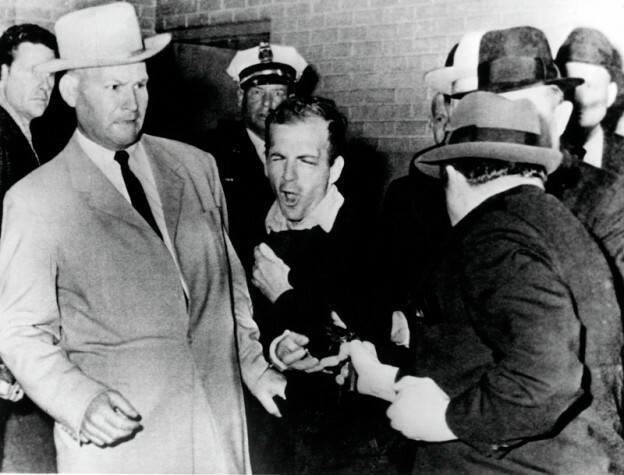 Oswald trusted someone or some agency that was involved in the successful Dallas plot, so his punishment was to be ultimately framed for the assassination. Because of this very similar, yet aborted, ‘assassination plot’ that occurred in early November, the Kennedy brothers were sufficiently deceived that they momentarily let their guard down. Since their point man — Oswald — had successfully alerted them to the plot (which was further corroborated by other events involving Chicago law enforcement), they believed — incorrectly — that he was genuinely in the know. 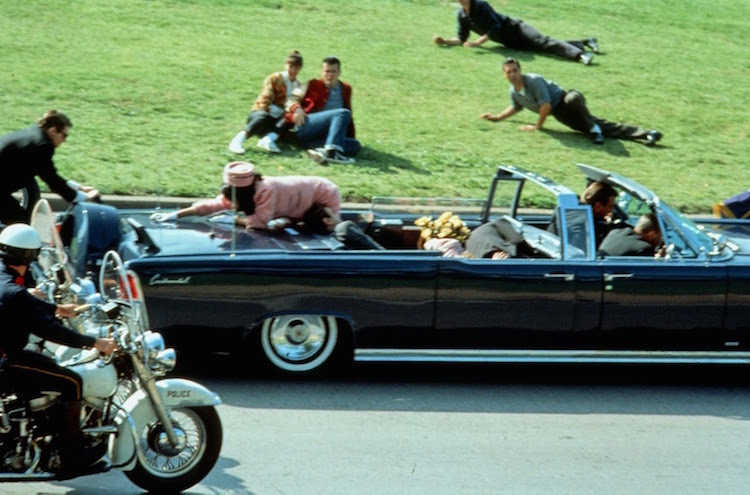 However, it appears that the November 2nd assassination attempt may have been a staged event all along in order to do exactly what it did — give the Kennedys a false sense of security during the lead up to the main event in Dallas. In that Chicago episode, Oswald may have been used — unknowingly — as a trusted messenger to RFK to deliver planted information which he did not know was an integral piece of the Dallas assassination plot. Also unknown to Oswald, the CIA execution team was quickly gearing up to execute their ‘Plan B’ scheduled for Dallas on 22 November. Here again, Oswald, in his ultra-secret capacity of working for Attorney General Robert Kennedy, had infiltrated the CIA cell that was working on the ground in both New Orleans and Dallas. This CIA advance team was getting everything ready in and around Dallas for the very public execution, one that JFK knew would happen sooner or later. Toward that end, the CIA had begun setting the trap for LHO in the Texas School Book Depository Building in Dallas where he was given a job. First, all CIA black ops are conducted in a highly compartmentalized fashion whereby each individual participates on a strictly need-to-know basis. Second, the fewest number of participants necessary are chosen for each component and phase of the operation. Third, there is minimal contact between the hit men and their handlers, between the decision-makers and the planners, between the financiers and their bag men. Likewise, every phase of the black op is implemented with the same degree of attention to these procedural details. In this way, Oswald only knew what he was told by perhaps one individual about a possible upcoming assassination plot in Dallas. According to various accounts, Oswald had a handler within the CIA by the name of “Maurice Bishop”, whose real name was David Atlee Phillips. Phillips was Dallas born and very well connected within the international intelligence community. His intimate involvement with the Alpha 66 — an organization of anti-Castro Cubans — surely caught the attention of the Kennedy brothers. As a primary CIA liaison with the Cuban exile community, his high profile was very unlikely to be mistaken. It appears, however, that Oswald would ultimately be undone by this particular relationship, being told only that an assassination plan was in works; not the when and the where and the how. Because of his extremely limited access to the actual CIA playbook that was being run in Dallas on 22 November, it’s apparent that Oswald was being fed incomplete and/or false information about the unfolding assassination plot. In order to keep him involved with the false conspiracy, Oswald’s handler must have fabricated a storyline which did not include any of the real details that would have alerted him to the November 22nd execution plan. 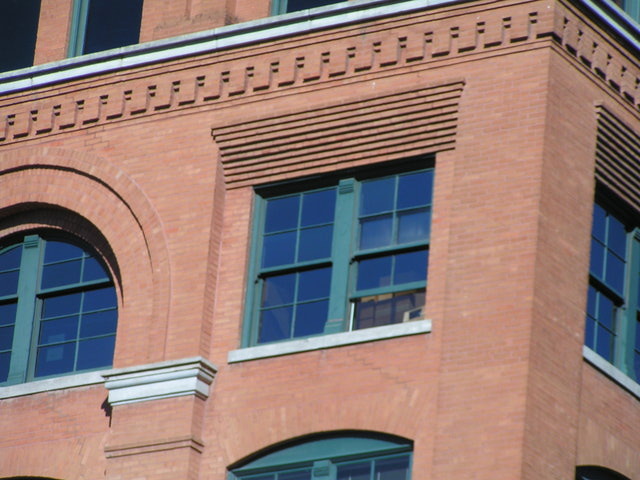 As a matter of fact, Oswald’s own supervisor at the Texas School Book Depository waved off Dallas police as they searched the building for an ‘alleged’ gunman right after the assassination took place. Oswald had been sitting with his boss in the break room during the actual assassination and was unaware that the shooting had even occurred. This is when Lee Oswald went into panic mode. He instantly grasped the gravity of events that were swirling around him. In his realization that the assassination had taken place without so much as a hint from his handler (or from so many other well-connected contacts and co-conspirators), he understood that he might be set up to take the fall. His behavior and quick movements that afternoon then reflected his desperation, which only reinforced the guilty image that the Feds were intent on projecting to the public. However, in the one nationally televised video recording where Lee Oswald loudly proclaimed his innocence and claimed complete ignorance of any murder plots, the CIA coverup team knew they had a serious problem. Oswald was probably speaking directly to Bobby Kennedy when he made repeated requests for “Legal Representation” (See video below), as well as a cryptic plea for special protection while in police custody. In fact, Oswald had so many connections to so many power players within the NOLA underground that the establishment knew that any kind of a trial would be catastrophic for their cause. Lee Oswald was certain to be the proverbial loose cannon where it concerned the exposure of any and all plots to subvert the Kennedy Administration or overthrow foreign governments. Even Robert Kennedy knew that Lee Oswald was dangerously radioactive. His future participation in a murder trial could prove to be disastrous for RFK because of his unique and under the radar relationship with him. Oswald’s testimony might even be construed by CIA-controlled prosecutors as Bobby’s complicity in the very assassination itself. However, as fate would have it, Lee Oswald was murdered by Jack Ruby while being transferred under police protection, under the glare of live media cameras. By quickly eliminating Oswald, the world would have closure … so the perpetrators thought. They also thought they could terminate all competing assassination theories by simply pinning it all on Lee Harvey Oswald. Instead, the whole Jack Ruby affair only opened up a vast number of possibilities that he was also a part of the real conspiracy, which he was. Which would then mean that Ruby himself was taking orders from someone above him within the overarching conspiracy. In this way, the whole misguided scheme has been systematically revealed over the years — piece by piece, person by person, part by part, perpetrator by perpetrator — so desperate are the real co-conspirators at the top not to be identified. As a matter of historical fact, the list of those dead and dying prematurely in the wake of the JFK assassination is seemingly endless. There are so many freak deaths and suicides, strange accidents and homicides, involving individuals associated with the assassination and its coverup that it boggles the mind. Clearly, Lee Harvey Oswald did not know all of those people. The three CIA-controlled triggermen who shot Kennedy in a triangulated configuration on site were only known to but a very few. Of course, there were bagmen, and setup men, and Secret Service supervisors, and CIA operatives, and Dallas Policemen, and Cuban exiles, and Mafia hit men, as well as many others who knew exactly what was to happen on that fateful day in November. Just how many “lone nuts” will the American people allow to be paraded across the Mainstream Media stage? How many patsies have the CIA and FBI set up over the intervening fifty plus years since the assassination of John F. Kennedy? That’s why this particular piece of history is so important and simply won’t go away. It just won’t die! Actually, it keeps repeating itself because the US ‘audience’ keeps falling for it. Isn’t that why this story is still one of the biggest of its kind after so many years? Perhaps only the 9/11 false flag operation has commanded more research time and investigative energy. Everyone knows that the Mainstream Media, on behalf of the US Federal Government, keeps pumping out one false flag after another, planting them wherever their purposes are best served. Fabricating patsies and fall guys undoubtedly consumes a considerable amount of their institutional budgets and personnel time. Of course, the public never sees the multitude of black budget operations that are financed through the illicit drug trade. Timothy McVeigh was obviously set up to take the fall for the Oklahoma City bombing. His van-delivered “fertilizer bomb” could never have produced the utter devastation sustained by the fastidiously imploded Alfred P. Murrah Federal Building. Then there is the much more recent ‘mass murderer’ Adam Lanza of Sandy Hook infamy. The most plausible scenario indicates that none of the schoolchildren were killed, or even injured. Let’s face it, if the citizenry of the USA had demanded a truly objective, impartial, scientifically-based investigation of Lee Harvey Oswald, he would have been proven stone-cold innocent. Which then begs the question: “Who did it?” And, much more importantly, “Why did they do it?”. Jeremy Gunn, the ARRB’s former counsel, spoke at Stanford University on May 18, 1998 about the investigation of the JFK assassination. He stated that, given what the ARRB discovered by way of hard evidence and credible testimony, he would much rather be defending Oswald than prosecuting him. What else did Bobby Kennedy know about Lee Oswald such that he was someone who could be trusted for such an ultra-secret and sensitive operation? Perhaps it was the fact that Oswald was formally trained by the CIA and had worked for the Office of Naval Intelligence. The following letter from John McCone, the Director of the Central Intelligence Agency to James J. Rowley, the U.S. Secret Service Chief, on March 3, 1964 clearly validates this important piece of Oswald’s resumé. Having been a dedicated Navy veteran, President Kennedy certainly could have reviewed Oswald’s official file military file in this regard. As an ex-Marine, Oswald presented all the right qualifications and necessary credentials required by the Kennedys for such a dangerous mission. That’s why they chose and thoroughly trusted him. At the end of the day, Lee Harvey Oswald will become highly regarded for performing valiantly, under extreme duress, in the defense of his country. He bravely honored his oath to defend the Constitution. By sacrificing his life in service to the US Attorney General and for the protection of the President of the United States of America, he ought to receive both the Medal of Honor and the Presidential Medal of Freedom, posthumously. In the soldier of Lee Oswald, the US Marine Corps produced a living embodiment of Semper Fidelis. In his short life he proved to be a person who was “always faithful” to his nation. And, to those who greatly relied upon his courageous acts of heroism, Lee Oswald was “always loyal”. JFK’s PROFILES IN COURAGE might now include the extraordinary and heroic self sacrifice of Lee Harvey Oswald. Although this exposé is focused on the CIA-Cuban-Mafia connection of the JFK assassination, the author fully acknowledges that the real conspiracy goes far deeper. The extremely volatile context of New Orleans was a convenient and credible cover story for the true perpetrators. District Attorney Jim Garrison of New Orleans was even permitted to conduct an investigation and trial in which many of the facts in this essay were ferreted out … but only regarding the part of the conspiracy that went only one level deep. In fact, the vast conspiracy to cover up the crime of JFK’s assassination was much more complex and difficult to manage. When November 22nd rolls around each and every year, those responsible culprits at the top have to go into spin mode because of the sustained and ardent curiosity of the ever-skeptical public. Nonetheless, the coverup has been largely successful over the past 50 years because of the pervasive, monolithic “conspiracy of silence” that was strictly maintained by the biggest ‘stakeholders’ at the very peak of the global power pyramid. Just who were those stakeholders who so benefited from JFK’s assassination? Unfortunately for the Kennedys, there were probably more within the Administration working against them than for them. Here, again, the addendum below provides a glimpse into the many powerful personalities and vested interests, government institutions and corporate entities, religious institutions and secret societies, which were hard at work on the other side. 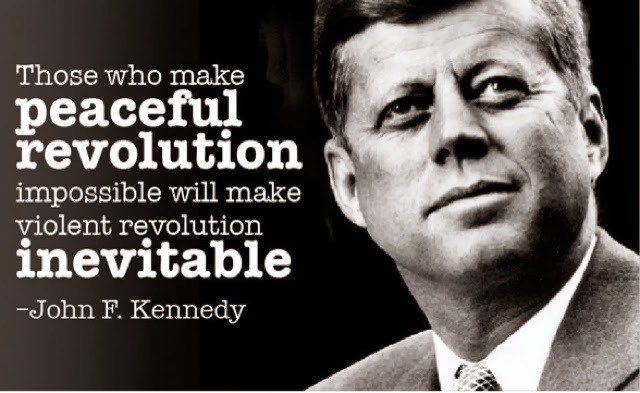 All of those implacable forces, it should be noted, were quite diametrically opposed to John Kennedy’s vow to replace the “perpetual war economy” with one known for “peace and prosperity”. (1) Here is the clip from that very day when Oswald denied any involvement with the assassination. It’s obvious that Oswald knew — from his own mouth — that he was being set up as a patsy. He even voiced that concern to his lover during the days before the assassination. Did Lee Harvey Oswald secretly work for Bobby Kennedy? (1) JFK issued Executive Order 11110 which essentially disempowered the Federal Reserve System. This international crime syndicate is a private banking cartel with no reserves and is not federal, since its owners are more foreign than domestic. Like President Andrew Jackson, he knew the FED had to go if there was to be freedom from permanent debt slavery for the USA. Needless to say, the NWO bankers would not tolerate such audacity, and JFK knew he would pay the greatest price. (7) JFK’s brother and US Attorney General, Robert F. Kennedy, launched an unprecedented war on organized crime, and particularly against the NYC, New Orleans and Chicago mob families. Obviously the American Mafia was not happy, especially after they allegedly helped swing the necessary Chicago vote (and therefore Illinois electoral votes) in JFK’s favor to win the election. Bobby, himself, admitted that his aggressive pursuit of the mob may have caused the demise of his brother. (10) JFK had very serious and powerful enemies in the form of Lyndon B. Johnson, George H. W. Bush, Richard N. Nixon, J. Edgar Hoover, Allen Dulles, Dean Acheson, Aristotle Onassis, Carlos Marcello as well as the British Crown whose intentions were well known by his ambassador father, Joseph P. Kennedy. The entire global power structure, particularly the US Military-Industrial Complex, and its many secret societies and covert organizations, were vastly arrayed against him. The World Shadow Government was determined to make an [UNFORGETTABLE] example of him. “Each of these 10 explanations standing alone would be considered extremely life-threatening to any sitting president of the USA. And these are just the top ten; there are many other brave initiatives undertaken by JFK which pitted him directly against the TPTB (The Powers That Be). — Who killed JFK? And why did they do it? John F. Kennedy knew that just a few years of systematic exposure of the New World Order agenda as implemented by the World Shadow Government would prove to be a boon to the future of humanity. And so it was! After all, once the JFK assassination conspiracy theories started to gain traction based on real merit, Pandora’s Box was literally opened for all time. People the world over soon realized that the great majority of historic events over the last hundred years were the product of equally calculated, complex and convoluted conspiracies. Yes, John F. Kennedy, working together with his brother, Robert F. Kennedy, and Lee Harvey Oswald, have shown the world that much of what we’re told is quite different from reality. So different, in fact, that were the truth widely known, this whole plane of existence would transform itself in a day and a night.